Here you see a map to get an idea how to get there. Scroll down for highway directions and take a look at the photo guide! If you are coming from the A3 (from direction Oberhausen for example) get on the B55a at "Kreuz Köln-Ost" into direction "Köln-Zentrum/Köln-Deutz". From there on, follow the photo guide. If you are on the A57, coming from direction Krefeld or Düsseldorf, get on the A1 at "Kreuz Köln-Nord" into direction Dortmund. At "Kreuz Leverkusen" change on A3, direction "Frankfurt/Köln". Then leave at "Kreuz Köln-Ost" on the B55a (Direction "Köln-Zentrum/Köln-Deutz"). From there on, follow the photo guide. If you are approaching Cologne coming from the east, coming from Dortmund for example, you most likely will be on the A1. Change to the A3 at "Kreuz Leverkusen" driving to "Frankfurt/Köln". Stay on that motorway until you reach "Kreuz Köln-Ost", driving onto B55a direction "Köln-Zentrum/Köln-Deutz" and follow the photo guide from there. From the A4, from direction "Olpe", stay on that motorway, which turns into B55a after "Kreuz Köln-Ost". Continue reading the photo guide from there on. If you come from Frankfurt on A3, simply stay on that motorway until "Kreuz Köln-Ost". 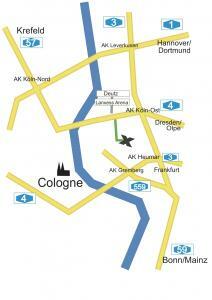 Change to the B55a (direction "Zentrum") and take a look at the photo guide from there. Coming from direction Aachen? Easy! Change onto the A3 (direction "Oberhausen/Düsseldorf/Olpe") and stay there until you reach "Kreuz Köln-Ost" where you switch over to B55a to "Zentrum". Stay on that motorway and follow the photo guide then. For those of you who would like to have all the travelling information gathered in once place: we now have everything in Google Maps.